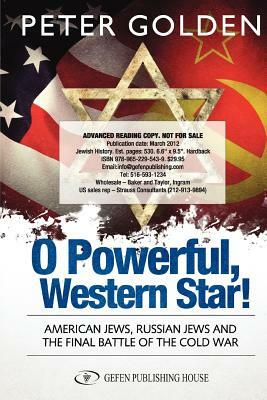 O Powerful, Western Star: American Jews, Russian Jews, and the Final Battle of the Cold War explores the hundreds of years of history that led American Jewry into the middle of the Cold War. The book's primary focus is on the impact of the Second World War, the Holocaust, and the founding of Israel on American and Soviet Jewry. The changes in American and Soviet culture, and the Cold War are explored in depth. Along with original documents, published histories, newspapers, journals, and magazines, Peter Golden also relied on his interviews with Mikhail Gorbachev, Ronald Reagan, Richard Nixon, Henry Kissinger, George Shultz, Larry Eagleburger, Richard Perle, and many other individuals connected to the events.